Having just talked about the oxidation ladder, it makes sense to start going into reagents for oxidation and reduction reactions. What it’s used for: Sodium borohydride is a good reducing agent. Although not as powerful as lithium aluminum hydride (LiAlH4), it is very effective for the reduction of aldehydes and ketones to alcohols. By itself, it will generally not reduce esters, carboxylic acids, or amides (although it will reduce acyl chlorides to alcohols). It is also used in the second step of the oxymercuration reaction to replace mercury (Hg) with H.
Similar to: lithium aluminum hydride (LiAlH4) although less reactive. For our purposes, sodium borohydride is really useful for one thing: it will reduce aldehydes and ketones. In this sense it traverses one rung on the oxidation ladder. Here are some examples of it in action. Notice the pattern: we are breaking a C-O bond and replacing it with a C-H bond. This is what helps us classify the reaction as a reduction. Note that we also form an O-H bond. This is where textbooks and other sources are sometimes not as clear as they should be: in order to make the alcohol, the oxygen needs to pick up a proton (H+) from either water or acid that is added after the reaction is complete (note: this is often referred to as the workup). NaBH4 also makes an appearance in the oxymercuration reaction. 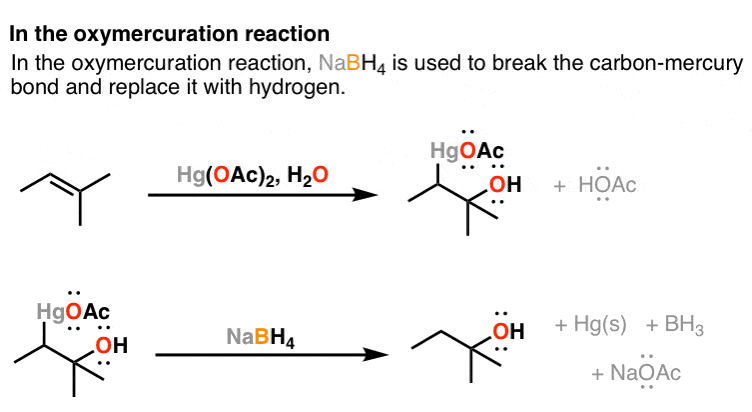 Specifially, NaBH4 is used in the second step of the reaction, to break the C-Hg bond and turn it into a C-H bond. 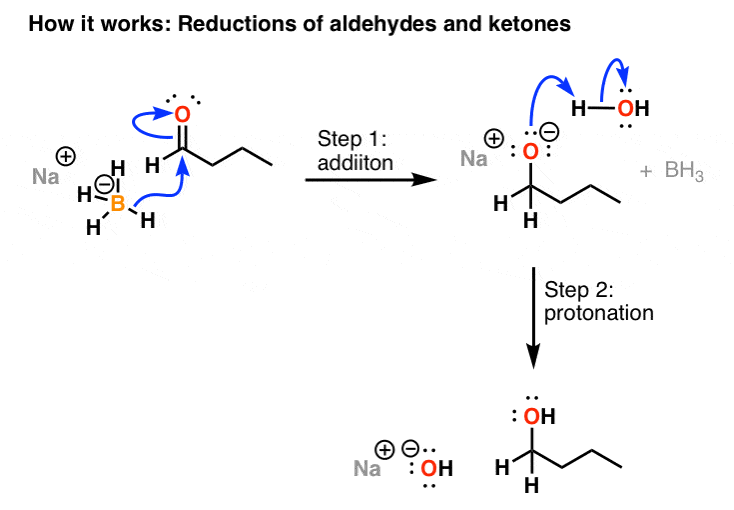 The mechanism of the reaction of sodium borohydride with aldehydes and ketones proceeds in two steps. In the first step, H(–) detaches from the BH4(–) and adds to the carbonyl carbon (an example of [1,2]-addition). This forms the C-H bond, and breaks the C-O bond, resulting in a new lone pair on the oxygen, which makes the oxygen negatively charged (FYI: we call these negatively charged oxygens alkoxides, as they are deprotonated alcohols). In the second step, a proton from water (or an acid such as NH4Cl) is added to the alkoxide to make the alcohol. This is performed at the end of the reaction, a step referred to as the workup. I suppose I should also mention that NaBH4 will reduce acyl halides to alcohols, but things are a little lengthy here already. P.S. You can read about the chemistry of NaBH4 and more than 80 other reagents in undergraduate organic chemistry in the “Organic Chemistry Reagent Guide”, available here as a downloadable PDF. What does the reaction between sodium borohydride and copper II oxide look like? I will go with the ACS guide’s interpretation of reality for the exam, I guess, but which source is correct? In Org 2 you learn about “conjugate addition” (like the Michael reaction) where nucleophiles add to alkenes adjacent to a carbonyl. NaBH4 can do “conjugate addition” as well. However conjugate addition only occurs when there is a good electron withdrawing group adjacent to the alkene. It doesn’t work for, let’s say, butene. Can anyone explain reduction of esters using NaBH4? Esters don’t generally reduce. Esters can sometimes be reduced with LiBH4, the Li+ is more Lewis-acidic and can coordinate to the carbonyl oxygen making it more electrophilic. Can NaBH4 reduce benzoic acid to benzaldehyde? I have C=C double bond in conjugation with ester in Biginelli compounds. If this reagent NaBH4 will work for reduction of C=C bond? It’s going to be tougher because the ester enolate intermediate is a stronger base than the ketone enolate. Conjugate reduction works for alpha-beta unsaturated nitriles, so it’s reasonable to think that it should work for alpha-beta unsaturated esters too. Can these reactions go back? What’s stopping it from going back? What’s to stop it going back is that you’d have to break a C-H bond, which is not easy to do. These reactions are not reversible. Once you get the alcohol, however, you could always re-oxidize to the aldehyde or ketone with something like PCC. Can NaBH4 reduce Beta-keto sulfones to B-hydroxy sulfones. Yep, I would expect that it could. Although the ketone will be spending a considerable amount of time in the enol form. No, even if it does it would make a hemiacetal and formation of that is reversible. What should be the molar ratio while using NaBH4 on commercial production of a molecule to be converted to alcohol? Slight excess, e.g. 1.1 equivalents. My professor said NaBH4 does not reduce esters but can reduce lactones which are cyclic esters. What is the reason for that? Thank you for your practical tips, I’m a first year graduate student and this website is an amazing resource. An ordinary alcohol should not interfere with the reduction of the ketone, but then you will have two alcohols and will have to differentiate them somehow. How do you plan to do that? If in a alkane chain there is a C=C and aldehyde group. Will NaBH4 reduce both? Yes, it can. The way around that is to add anhydrous CeCl3, which will lead to a regioselective reduction of the carbonyl and it will leave the alkene alone. This is called the Luche reduction. What are the advantages of using NaBH4 as reducing reagent in comparison to LiAlH4?? Much milder reagent. Only reduces aldehydes and ketones, so you don’t have to worry about your esters getting reduced. Also, the workup is very simple. Usually just add saturated NH4Cl or similar, extract and dry. With LiAlH4, the aluminum salts are a pain, so you have to stir with Rochelle’s salt or do the Fieser workup protocol. What if NABD4 is used? Then you will form a C-D bond instead. Can be a very useful method for incorporating deuterium. The product is likely some kind of alcohol. The water was likely there to provide a proton source so that you get the neutral alcohol product (not the alkoxide, which would be a salt). Working backwards, you have a carbonyl compound of some kind. C3H6O only gives you two places to put it – on C-1 (which would be propanal) or C-2 (which would be acetone). Easy enough in most cases. NaBH4 should be fine. Would NaBH4 reduce an alkene adjacent to an imine? 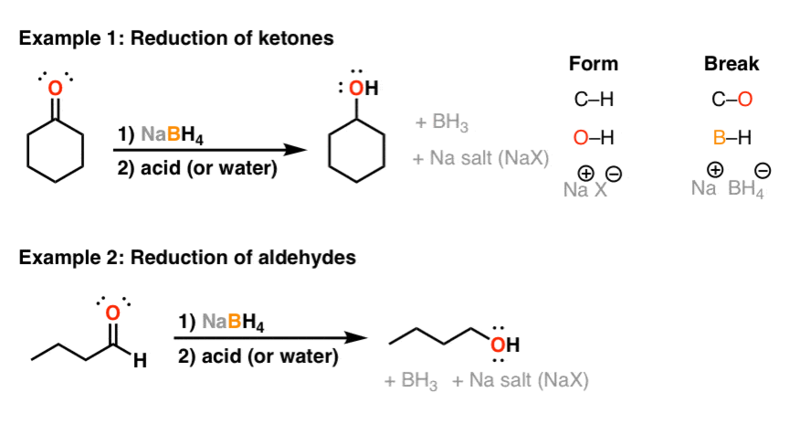 Hi MIchael – in general NaBH4 will reduce the alkene in alpha,beta unsaturated ketones (“conjugate reduction”) unless a strong Lewis acid such as CeCl3 is used (“Luche reduction”). NaBH4 will also do conjugate reductions of alpha beta unsaturated nitriles. With conjugated imines I am not 100% sure. The imine you’ve drawn is a simple one with an N-H substituent. These types of imines are not very stable and easily lose water. My first guess is that NaBH4 in the absence of a Lewis acid would also perform conjugate reduction but I am not sure. Is this for laboratory work or is this exam question related?